The renovation project of Stade Bollaert-Delelis may have cost roughly $90 million, but issues regarding protection against rain still remain. And they’re only top of a longer list. Officially Stade Bollaert-Delelis is complete since December 18, 2015. Redevelopment of the stadium consumed over €70 million (€83.6m including taxes, or $91m), but some fans are still left out in the rain. And quite literally so. 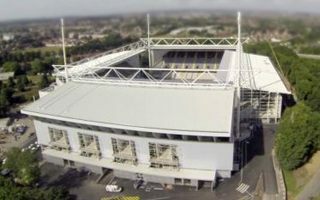 Because Lens lies in north-eastern France, rainfall often comes with winds and the reconstructed roof fails to protect many supporters. Ironically, among them are those paying by far the most for their seats, the VIPs located in the south stand. Sitting there costs €3,000-6,000 annually and yet bad weather may lead to very unpleasant experiences. The very same issue (along with view-obstructing pillars) was why the old roof was taken down in the first place. A much wider new one is now in place, held by 4 masts rising as high as 72 meters. But despite the height, rain could only be avoided in the stands if there was no wind. Meanwhile open corners and windy weather lead to a somewhat disappointing outcome. On Tuesday and Thursday meetings are planned to discuss possible solutions to the problem. There are a couple of ways considered to address the issue, one being expanding the roof further, another – raising all fans by 1 row. It’s not only rain protection that gets criticized. Perhaps most importantly, the black/grey/white seating is regarded as a poor choice after years with yellow-red seats representing RC Lens club colours. Not only the colour, but also selected model raise concerns as many seats are broken early into the revamped stadium’s operation. Then come the giant screens (neither giant, nor visible to all fans) and seemingly unfinished façade works in several minor areas. The list is longer, but there’s still time to address some issues before Euro 2016 comes to Lens.